Autonomous drones are set to take over border patrols, crime hotspot monitoring and more, says South Africa's Airborne Drones. Unmanned aerial vehicles (UAV)s, commonly known as drones, will soon be a common sight over border zones, crime hotspots and city streets, as public safety and security officials and police departments discover the cost saving and efficiencies offered by drone patrol 'armies', says Airborne Drones, a South African-based international manufacturer of enterprise-grade drones. 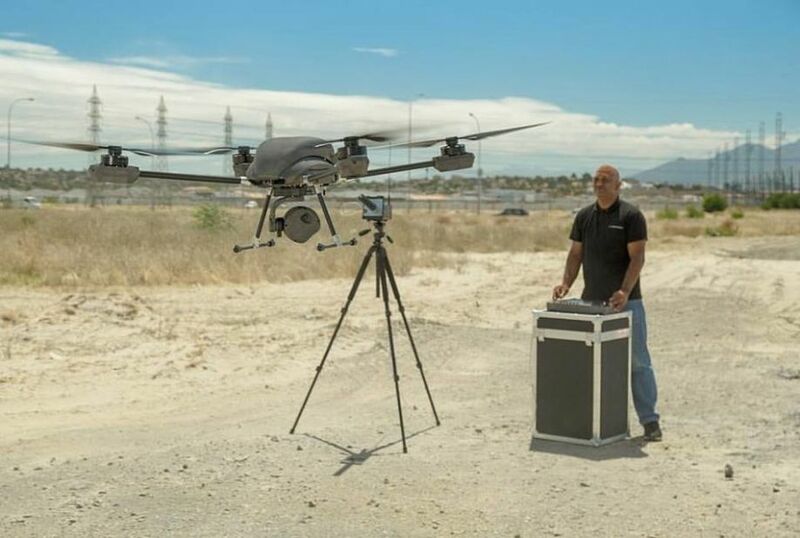 "Drones provide the ideal solution to the problems and limitations faced by other surveillance methods such as GPS tracking, CCTV camera observation, biometric surveillance and ground patrols," says Airborne Drones South Africa. "Aerial surveillance is increasingly being harnessed for security monitoring; but traditionally, this has been carried out using helicopters - which are costly to deploy - and with drones controlled by a user - which can be somewhat limited in terms of operating hours. However, drone surveillance does present an easier, faster, and cheaper method of data collection, as well as a number of other key advantages. Specialised security drones can enter narrow and confined spaces, produce minimal noise, and can be equipped with night vision cameras and thermal sensors, allowing them to provide imagery that the human eye is unable to detect. In addition, these UAVs can quickly cover large and difficult-to-reach areas, reducing staff numbers and costs, and do not require much space for their operators." "Autonomous, long-range security drones are at the vanguard of new policing methods", says Airborne Drones South Africa. "Offering live video feeds to ground control stations, these drones can range autonomously over pre-programmed flight paths for extended periods of time, allowing for ongoing routine patrols across wide areas such as borders, maritime regions and high security installations. Should an incident be detected, ground crews can then follow objects or intruders from a safe distance, providing visual support to safety and security teams. UAVs can provide detailed visual documentation of sites, enabling effective analysis, risk management and security planning." "Numerous countries are already rolling out security drones to support their public safety and defence initiatives", says Airborne Drones. UAVs are also instrumental in managing transport infrastructure safety and security and event security, from event security infrastructure through to spectator and crowd control and safety, to overall health and safety planning around the world. Israel has long harnessed advanced drones for military surveillance, and recently sold a fleet of so-called 'spy drones' to the Irish army; the US FBI has also used drones for surveillance and tracking for several years. In Australia, a new $50 million Defence Cooperative Research Centre will develop long-range drones, automated vehicles and robots to help Australian soldiers fight the wars of the future. India is currently looking to military-grade UAVs for maritime and other surveillance and intelligence gathering, Brazil's São Paulo last month became the first Latin American city to use drones for public security surveillance, and the German city of Hamburg this week said it would deploy surveillance drones as part of its arsenal against an expected 100,000 demonstrators at the G20 summit this weekend. In Australia's New South Wales, the authorities are even using helicopter and drone surveillance along the coast to protect holiday makers from rip currents and sharks. "Drones are ideally suited for reconnaissance or rapid situation awareness with application for ground force units to detect and monitor potential threats; and they also provide an additional oversight in instances where security guards are deployed to ensure their adherence to patrolling routines. Their speed, size, maneuverability and additional technologies make UAVs the perfect supplement to ground security teams seeking to perform monitoring tasks more quickly and efficiently. Drones have a competitive edge over stationary cameras, as intruders can't easily step out of sight, and they can cover areas that are normally out of reach. Security drones add a whole new dimension to surveillance, safety and security, and as such, we can expect them to be commonly in use in every country in the world within just a few years," says Airborne Drones.